In less than 6 months, my honey and I will be honeymooning! I am SO excited for the honeymoon. 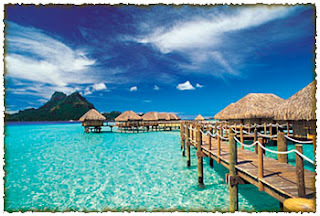 I'm getting my dream vaca and we're both going somewhere we've neither been..... (drum roll).... French Polynesia!!! We will have quite the travel time going and coming but it will be totally worth it. How many other times do you get to take off for your dream vacation with your dream husband?? Plus, Adam and I have always spent our vacation time either going to Michigan or West Virginia so this is a trip that's JUST for us. 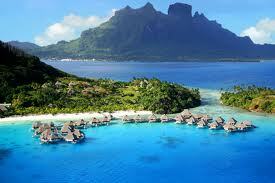 We will fly from Atlanta to LA and then to Papeete (capital of Tahiti). It's an 8-hour flight from LA to Tahiti; we will stay the first night in Tahiti and then take a ferry to Moorea. We're staying at the Hilton Moorea in an overwater bungalow!! So excited!! After 3 nights, we take a very short flight to Bora Bora where we will be staying at the Hilton Bora Bora in another overwater bungalow. Then it's back to reality after 10 days of bliss. We are looking into scuba diving while we are down there.. have to see if I'm brave enough first!! !